I am searching for a certain top punch for a Lyman mold/bullet. I can't seem to find a chart that tells the correct one to use. Lyman products is not answering or their phone system is inop. The mold part no. is 429303. The Lyman no. is 26603003. Since it is a pointy bullet, I can't just use any old .44 caliber top punch, as it can deform the bullet nose. Much obliged for the help! YOU MAKE IT LOOK EASY!!! I had found that #303 yesterday, but I could not verify it in any Lyman or Saeco charts. Time for JB Weld and a greased bullet??? Go over to castboolits.com and contact Lathesmith. He can produce any profile punch and cost are reasonable. I used to have a Lyman top punch modified to size these bullets. But I can't locate it. I have a new one ordered. 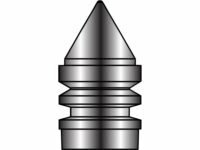 I do have a bullet seater/crimp die that has it's top screw contour machined so that it doesn't deform these pointed slugs.